In oil drilling mud treatment system, the drilling fluid that returns from the well first passes through a linear motion shale shaker and then into other solids control equipment. 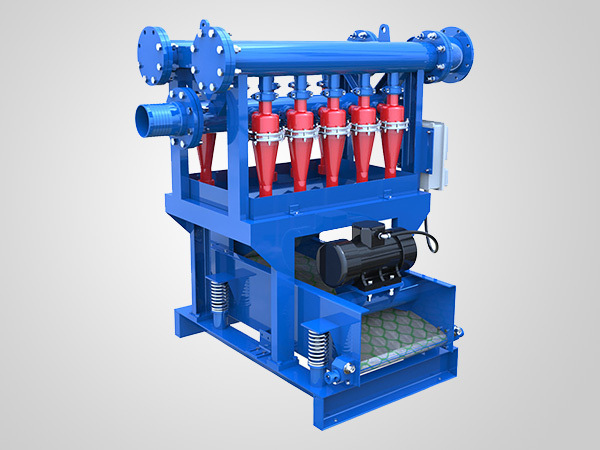 Shale Shaker is a filtering mechanical separation equipment. It features the first and fastest separation of solids in the solid phase in an entire solid-phase clean-up system, as well as an economical and efficient separation plant. 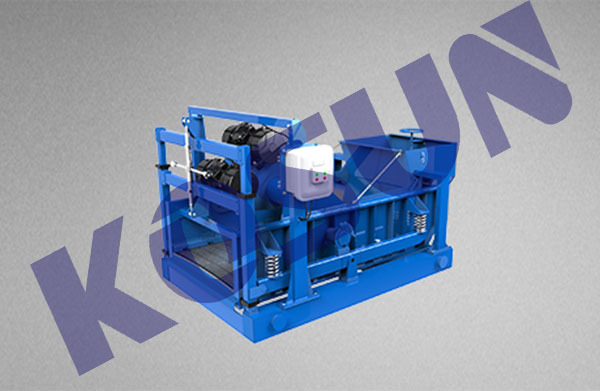 Compared with other solid control equipment, KOSUN linear motion shale shaker has obvious advantages when dealing with large displacement drilling fluid, powerful excitation force output by the drilling fluid vibrating screen, rapid removal of a large amount of solid phase through efficient drilling fluid vibration trajectory. 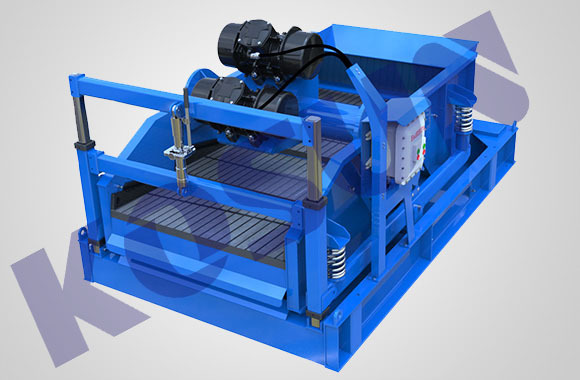 Linear motion shale shaker can effectively remove larger particles in the drilling fluid. 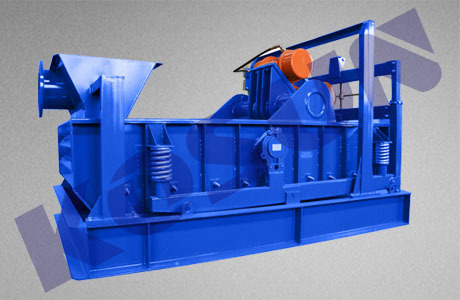 (1) Vibrating Form – There are three types of vibrating screen motions, circular, elliptical and linear. Each form of motion is generated by the difference in the center of gravity of the system. Linear movement is the oscillator on the top of the system before the center of gravity, the screen frame to produce linear motion, thus clearing the solid phase. Straight-line motion has a constant cut-off speed of the cuttings, which can be either flat or slightly inclined. (2) Amplitude and frequency – The sieve capacity of the shaker depends on three parameters: amplitude or stroke, vibrational mode and pendulum rotation speed. Most circular motion shakers have 4-6 times the acceleration of g, most of the linear motion of the shaker has 3-4 times the acceleration of g.
KOSUN Linear Motion Shale Shaker is especially effective while drilling top-hole sections where heavy and high-volume solids are usually encountered. In these intervals, shakers may generate powerful G-forces and its effective vibrating motion can quickly remove the dense solids from screens and particles from wells. Shale shaker is the first stage of solids control equipment in drilling purification system. It can remove cuttings above 75 μm brought from the drilling well to leave the liquid with smaller particles into the tanks below, which will flow into next grade solids control equipment for further treatment. 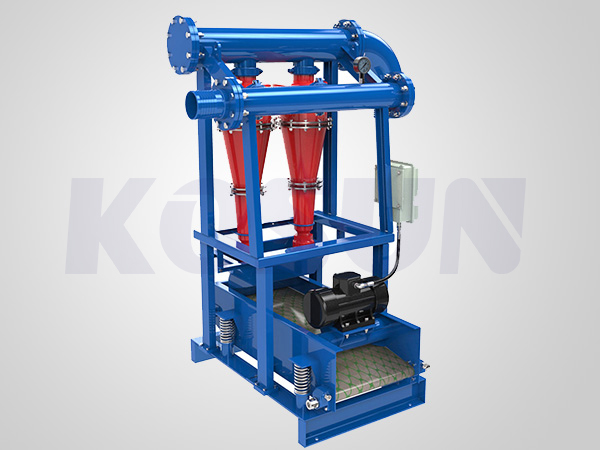 KOSUN patented shale shaker is the equipment with welded structure. Vibration motor & screen plate base are installed into screen basket with special parts. Screen basket is fixed on the adjustment beam. At each of the four vertexes of the screen basket put a vibration damping spring, which can prevent the adjoining parts and devices from being affected by the vibration. There are several shale shaker screen panels on screen basket, and they are fixed and adjusted by snap-on screw bolts and hooking tensioners so that the combined effect of horizontal and vertical supporting bars can provide enough strength for screens basket. And the panels are in an arched shape, thus making the panels more easily tensioned and more intimately connected with the frames, extending their service life as well as increasing the processing efficiency of particles. 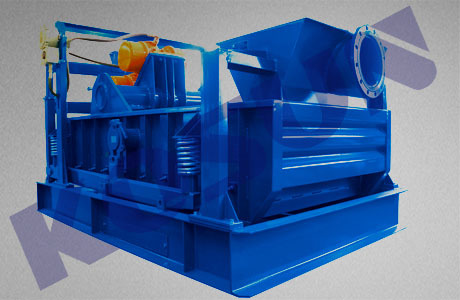 KOSUN S™ series shale shaker types consist of linear motion shale shakers and Balanced Elliptical Motion shakers. Linear Motion Shale Shaker of Kosun is especially effective while drilling top-hole sections where heavy and high-volume solids are usually encountered. In these intervals, shakers may generate powerful G-forces and its effective vibrating motion can quickly remove the dense solids from screens and particles from wells. 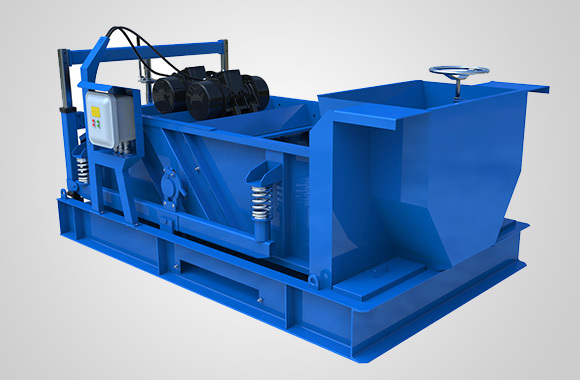 Balanced Elliptical Motion Shaker Usage: In drilling top-hole sections where heavy, high-volume solids, it can remove viscous solids and eliminate larger particles in drilling fluids. Shale Shaker: The shale shaker is the first stage of solids control equipment in drilling purifi-cation system. It can remove cuttings above 75μm brought from the drilling well to leave the liquid with smaller particles into the tanks below, which will flow into next grade solids control equipment to be treated. Desilter: In the 3rd stage of solids control for drilling mud, the desilter by Kosun makes separations between 15 and 45 μm. Characteristics of desilter by Kosun: 1. 100% Polyurethane ( PU ) material to make desilter cones for longer lifespan. 2. Clamp type for easy maintenance. 3. Compact design with small footprint. 4. Flexible options for 8, 10, 12, 16 or 20 pieces of 4″ or 5″ cones for different capacities. 5. Flexible fast connection is available for user assembly. Desander: In the 2nd stage of solids control for drilling fluids, desander makes separations between 45 and 75 μm. Characteristics of desander by Kosun:1. Polyurethane ( PU ) material or high-chromium cast iron to make desander cones for longer lifespan. 2. Clamp type for easy maintenance.3. Compact design with small footprint. 4. Flexible options for 1, 2 or 3 pieces of 10″ or 12″ cones for different capacities. 5. Flexible fast connection are available for user assembly. The shale shaker is the first stage of solids control equipment in drilling purifi-cation system. It can remove cuttings above 75μm brought from the drilling well to leave the liquid with smaller particles into the tanks below, which will flow into next grade solids control equipment to be treated. In the 2nd stage of solids control for drilling fluids, desander makes separations between 45 and 75 μm. Characteristics of desander by Kosun:1. Polyurethane ( PU ) material or high-chromium cast iron to make desander cones for longer lifespan. 2. Clamp type for easy maintenance.3. Compact design with small footprint. 4. Flexible options for 1, 2 or 3 pieces of 10″ or 12″ cones for different capacities. 5. Flexible fast connection are available for user assembly. In the 3rd stage of solids control for drilling mud, the desilter by Kosun makes separations between 15 and 45 μm. Characteristics of desilter by Kosun: 1. 100% Polyurethane ( PU ) material to make desilter cones for longer lifespan. 2. Clamp type for easy maintenance. 3. Compact design with small footprint. 4. Flexible options for 8, 10, 12, 16 or 20 pieces of 4″ or 5″ cones for different capacities. 5. Flexible fast connection is available for user assembly. As we all know, Shaker screen is the largest consumable wearing device for solids control equipment.A Cost-effective shaker screen can not only ensure the screening quality of drilling mud, but also can extend the trial life of shale shaker. Shale shaker screens consume a portion cost of drilling, so a cost-effective shaker screen is needed by many drilling contractors. KOSUN developed a high-quality shaker screen through years of research and trial. Recently, KOSUN has produced a number of screens for the FLC2000 shale shaker. It has been tested by third parties and fully compliance with international standards. 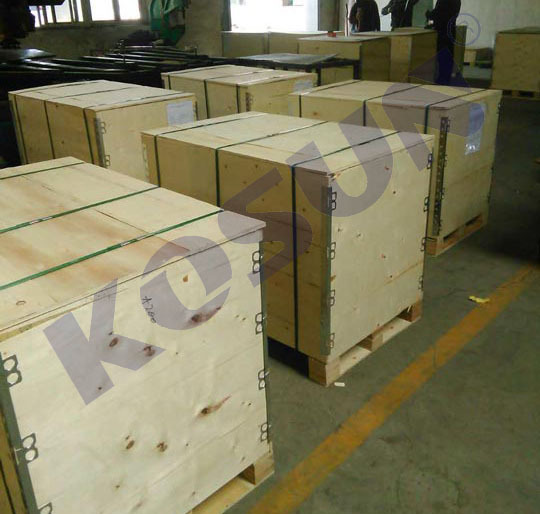 610 Pieces of KOSUN Shaker Screens are ready to delivery to Iran. KOSUN has been the leading China OEM supplier of quality, high performance screening surfaces for over 20 years. Our entry into manufacturing screens for kinds of shakers has come at the request of numerous operators who desire to improve the performance of their shakers by taking advantage of Kosun’s screen manufacturing technology. KOSUN now has screens available for kinds of internationally renowned shale shakers. -Available for Derrick, Brandt, Swaco and KEM-TRON brand shakers. Kosun centrifugal machine—new technology,new products.